The skull of Sclerocormus reinterpreted. Figure 1. 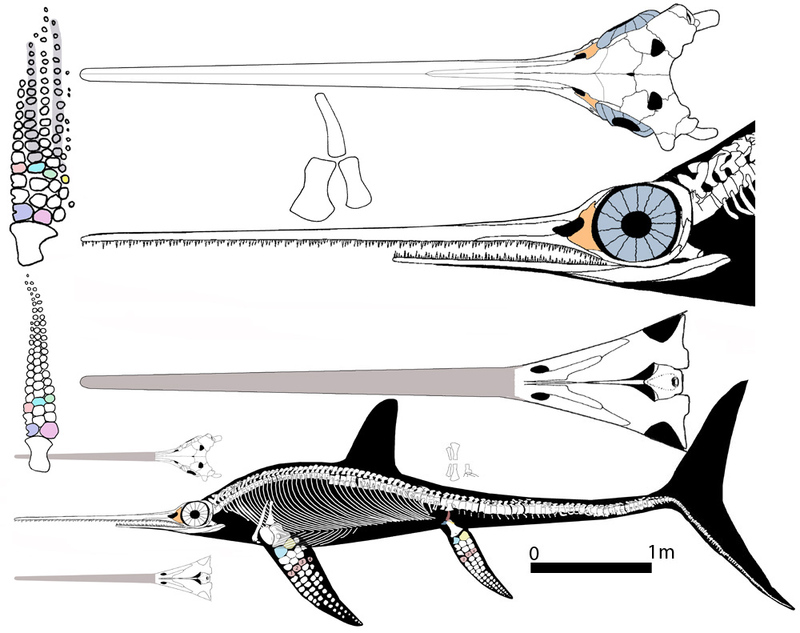 Large Sclerocormus and its much smaller sister, Cartorhynchus. These nest with basal sauropterygians, not ichthyosauriforms. The odd thing about this genus is really the short neck, not the small head. Yesterday we looked at the new basal sauropterygian with a tiny head, Sclerocormus (Figs. 1, 2). Originally Jiang et al. 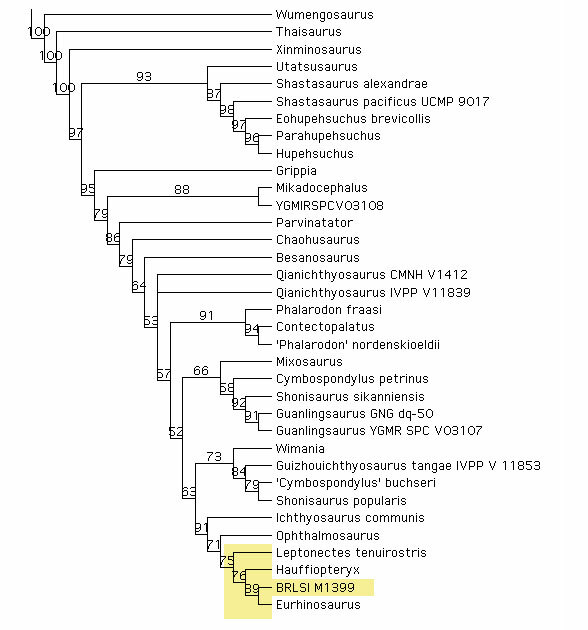 2016 considered Sclerocormus ‘a large aberrant stem ichthyosauriform,’ but their cladogram did not have the stem ichthyosauriforms recovered by the 684-taxa reptile tree, Wumengosaurus, Thaisaurus and Xinminosaurus. Basal sauropterygians often have a tiny skull. Check out these examples: Pachypleurosaurus, Keichousaurus, Plesiosaurus, Albertonectes. Given this pattern, the odd thing about Sclerocormus is its short neck, not its tiny skull. The outgroup, Qianxisaurus has a skull about equal to the cervical series. the terms ‘aberrant’ or ‘engimatic’ usually translate into “somewhere along the way we made a huge mistake, but don’t know what to do about it.” For the same reason, pterosaurs are widely considered ‘aberrant’ archosaurs, Vancleavea is an ‘aberrant’ archosauriform, Daemonosaurus and Chilesaurus are aberrant theropods and caseasaurs are ‘aberrant’ synapsids. All of these taxa also nest elsewhere in the large reptile tree. several of the Jiang et al interpretations of the skull could not by confirmed by DGS tracings (Fig. 2). Others were just fine. Figure 2. Sclerocormus skull as originally interpreted and reinterpreted here. here are the stem ichthyosaurs and a sampling if ichthyosaurs (Fig. 3). Note where hupehsuchids nest, as derived utatsusaurs and shastasaurs. Cartorhynchus and Sclerocormus (Fig. 1) do not nest here. Figure 2. Subset of the large reptile tree focusing on ichthyosaurs. Note most of the more derived ichthyosaurs from Marek et al. 2015, are not listed here. So we’re not comparing apples to apples here. Figure 1. 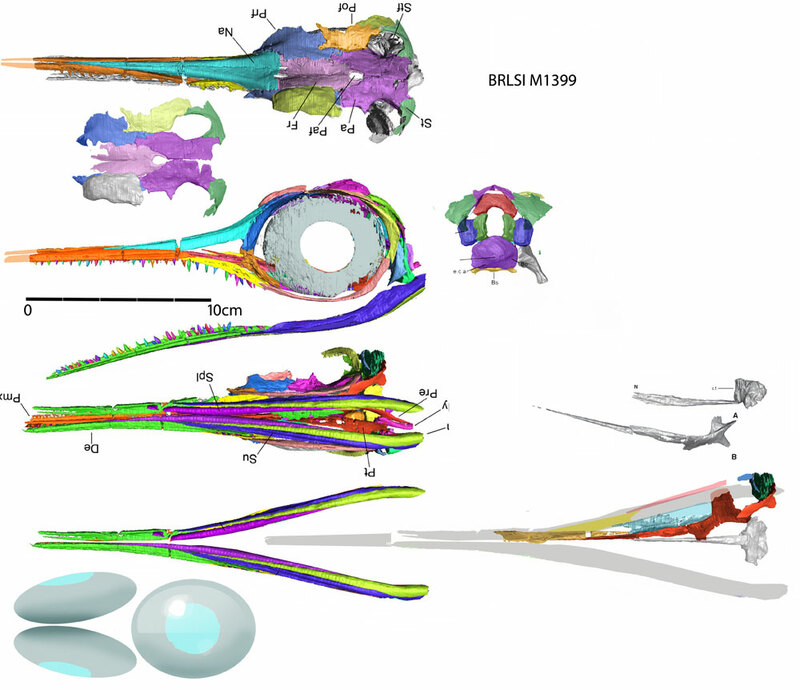 Hauffiopteryx, BRLSI M1399, is a new ichthyosaur that has been subjected to CT scanning and colorizing. It had huge eyeballs evidently not spherical in shape (there was no room in the skull). The original paper did not put the palate together or separate the posterior mandibles. Those are remedied here. At lower left are hypothetical eyeballs. A short F-stop is ideal for light gathering. Click to enlarge. 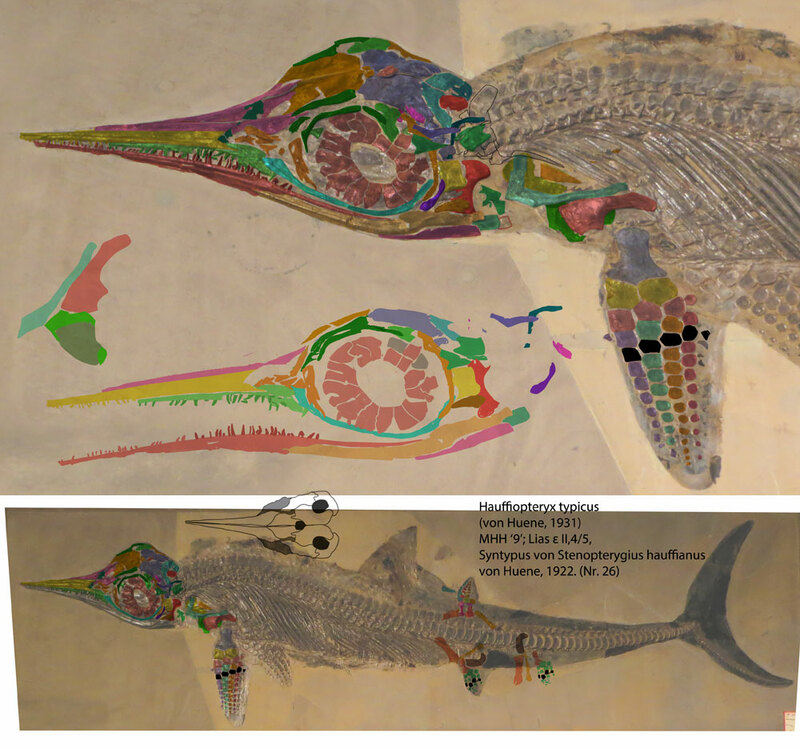 A new ichthyosaur, Hauffiopteryx, has been CT scanned. You can see a rotating image of that Marek et al. (2015) scan here. Figure 2. From Marek et al. (2015), a cladogram of the higher ichthyosaurs. Pink arrow points to Eurhinosaurus and Leptonectes where Hauffiopteryx nests when the more derived taxa are not included on the large reptile tree. Figure 3. Subset of the large reptile tree focusing on ichthyosaurs. Note most of the more derived ichthyosaurs from Marek et al. 2015 (Fig. 2), are not listed here. So we’re not comparing apples to apples here. Figure 4. A more complete but crushed specimen of Hauffiopteryx along with tracings and reconstructions of key parts. Click to enlarge. Black hand bones are metacarpals. Note the differences in maxilla length. The 3D specimen appears to have a shorter maxilla no further forward than the naris, unlike the crushed specimen or Eurhinosaurus. Two species of Ophthalmosaurus show the same sort of variation. of Hauffiopteryx have a box-like cranium housing huge eyes along with a small, sharp rostrum. Ophthalmosaurus, Leptonectes and Eurhinosaurus (Fig. 6) more or less share these traits and, give the taxon list of the large reptile tree, they all nest together. This may change with the addition of more taxa, as shown in figure 2. In the CT scanned specimen (Fig.1) a slender bone extends along the ventral naris and extends slightly outside of it. In the crushed specimen (Fig. 2) the area ventral to the naris is crushed and broken. In sister taxa the lacrimal extends along the lower rim of the naris, but it was not colorized that way in figure 1. So I wonder about it. In the 3D specimen (Fig. 1) the yellow maxilla does not extend anteriorly beyond the large narrow naris. That’s not the case in the crushed specimen or Eurhinosaurus. Similarly in various species of Ophthalmosaurus the maxilla may be long or short. In the 3D specimen (Figs. 1, 5) there is a depression aligned with what would have been the pmx/mx suture. So I wonder if part of the maxilla in the 3D specimen was improperly colorized originally?The tiny teeth at the anterior of the possible maxilla suggest that may be the actual maxilla Marek et al. may have misidentified a splintered break as a suture. Figure 5. The disputed maxilla in BRLSI M1399. Marek et al. colorized the maxilla only to the anterior naris, but that might be a break. Some sister taxa extend the maxilla beyond the the naris and the tiny teeth at the thin anterior of the new maxilla both indicate a possible error was made, mistaking a break for a suture. If valid, this is what DGS can do. Click to enlarge. If the traits identified here are valid, Hauffiopteryx and its new sister are closer to Eurhinosaurus (Fig. 6) than Marek et al. nested them. Though relatively smaller, the crescent-shaped tail of the crushed Hauffiopteryx (Fig. 4) is also similar to that of Eurhinosaurus (Fig. 6). Figure 6. Eurhinosaurus, a derived ichthyosaur, in several views. Marek RD, Moon BC, Wiliams M and Benton MJ 2015. 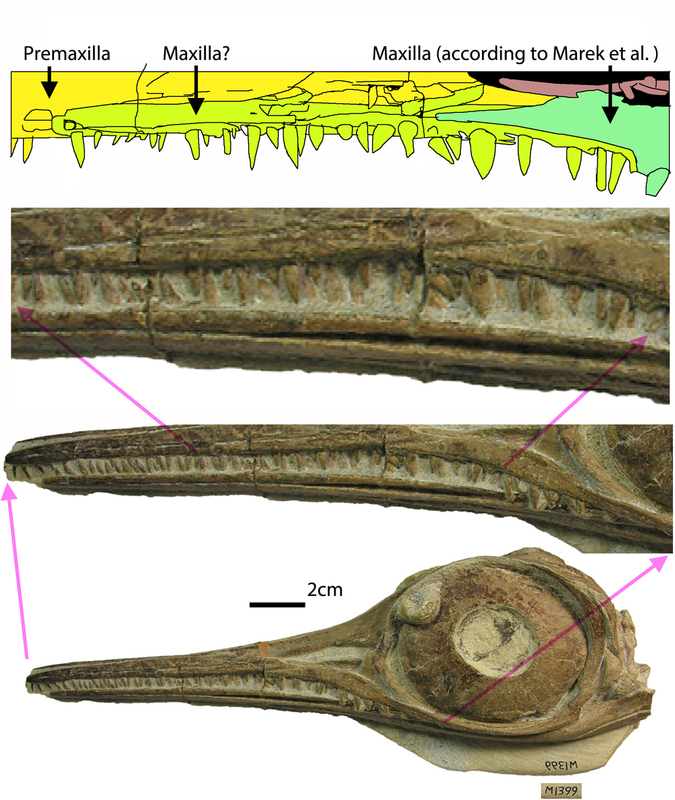 The skull and endocranium of a Lower Jurassic ichthyosaur base on digital reconstructions. Palaeontology 2015: 1-20. Figure 1. Ichthyosaur skulls in phylogenetic order (top to bottom). Many illustrations from Maisch and Matzke 2000. Not to scale. Ichthyosaur phylogeny has been examined by Motani (1999), Maisch and Matzke (2000) and Maisch (2010). The large reptile tree (Fig. 2) offers yet another solution and finally have the correct outgroup taxa included. All four of these studies are broadly similar, but do differ from each other in detail. Note (Fig. 2) the two Shonisaurus specimens do not nest together. Neither do the two Cymbospondylus specimens. Earlier we talked about all the specimens attributed to Shastasaurus. Maisch MW 2010. 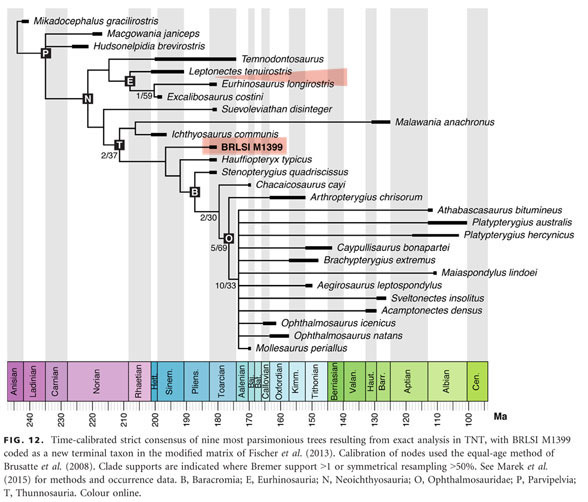 Phylogeny, systematics, and origin of the Ichthyosauria – the state of the art. Palaeodiversity 3: 151-214. Maisch MW and Matzke AT 2000. “The Ichthyosauria”. Stuttgarter Beiträge zur Naturkunde: Serie B 298: 159.